The surprising success of J. Carroll Mansfield's Highlights of History Sunday page, a rather dry feature offering storybook-style tales of the past, naturally enough spawned imitators. The Hearst camp came up with theirs pretty late in the game, debuting Heroes of American History in 1936, over a decade after Mansfield's strip began. This Sunday-only strip was presumably offered in syndication, but I've never seen it appear anywhere except in Hearst papers. That shouldn't be surprising, because it really offers nothing to editors that wasn't already fulfilled by Mansfield's strip. Granted, artist Nick Afonsky could draw rings around Mansfield, but since he was already producing the art for the Little Annie Rooney Sunday, Heroes of American History sometimes looks just a tad rushed by Afonsky's usual sandards. The writer of the strip was never credited and it is just as well because it is some seriously stilted and wordy stuff. "Sanguinary battles," oh please. These are comics, not a master's thesis. 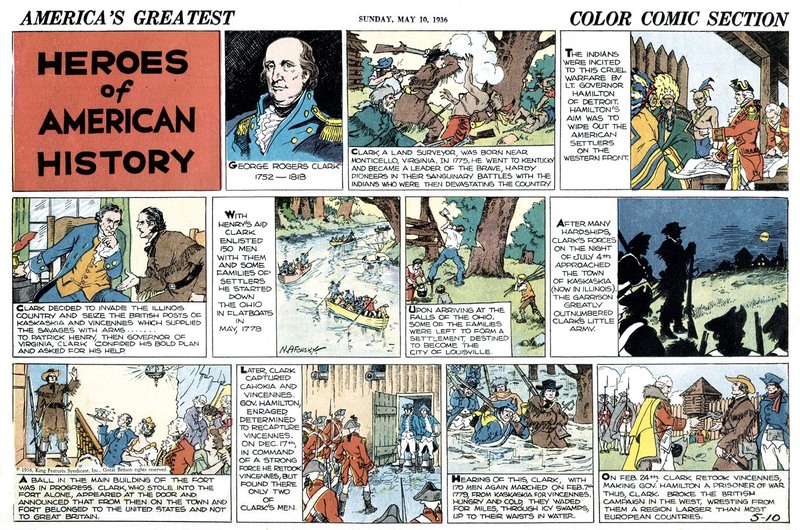 An interesting aspect of Heroes of American History is that, as best I can tell, it was produced only in half-page format. It offered no topper to flesh it out to full page, and not even a tab configuration seemed to be available. Could this be a first for Hearst since full page features became the norm in the 1910s? They had a 1935-36 experiment with tab-only features (Kewpies and Hejji, for instance), but I think this might be the first half-page only feature for them in the 'modern' era. It didn't take long to realize that Heroes of American History was not going to steal any of Mansfield's papers. Perhaps also Afonsky was complaining of overwork. In any case, the strip only made it about a year and a half, from March 22 1936* to August 15 1937**. Or maybe they felt like they'd covered all the important bits of American history by then? I'm sure I have seen the "Heroes" in a non-hearst, tab section, just struggling to recall where. I'm thinking it was possibly the Miami Tribune?